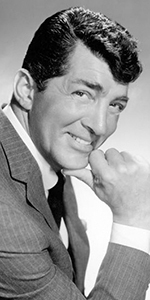 Dean Martin was one of the most popular performers in the post World War II era. Originally pairing up with comic Jerry Lewis as his singing straight man, the duo made a string of successful pix for Paramount. When the act broke up, Martin continued with both singing and movies, eventually becoming a sort of standard for men everywhere to shoot for. Born to an Italian immigrant father and Italian-American mother, young Dino spoke Italian until he entered school at the age of five. Bullied on account of his poor English, Dino took up the drums, but also worked as a bootlegger, a croupier and blackjack dealer in a speakeasy, in a steel mill, and as a boxer, billing himself as "Kid Crochet." Sharing an apartment in New York City with future Jimmy Durante sidekick Sonny King, the two would fight each other, charging people to watch. Dino eventually began singing with nightclub bands, getting a break to sing with Ernie McKay. By the early 1940s, he was with Sammy Watkins, who suggested the name of Dean Martin. Married now with children, Martin met Frank Sinatra in 1943, so they go back a ways. Martin was drafted into the Army in 1944, but was classified 4-F and discharged. Always the crooner, Martin was having difficulty standing out in a crowded field. 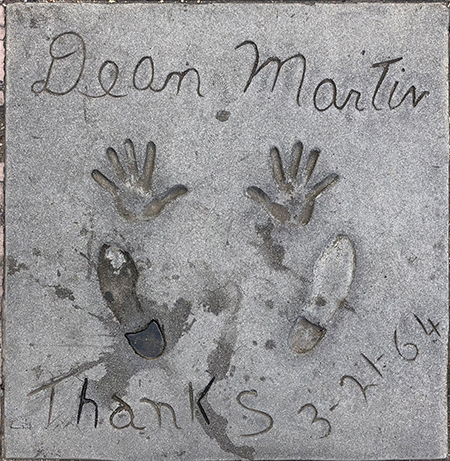 Performing at the Glass Hat in New York one night, he met comic Jerry Lewis, with whom they would develop an act with Dean singing, with Jerry playing all manner of characters who would interrupt him. They made their debut in Atlantic City in 1946. Their act was a hit, landing the duo on the very first television episode of The Ed Sullivan Show aired over CBS in June, 1948. Hiring writer Norman Lear took their act to greater levels, with a radio program appearing in 1949. Producer Hal B. Wallis hired Martin and Lewis as comedy relief for My Friend Irma (released in October, 1949), and their film career took off. Martin and Lewis' chief films are: Jumping Jacks (released in June, 1952), Scared Stiff (released in April, 1953), The Caddy (released in August, 1953), Living It Up (released in July, 1954), and Artists and Models (released in November, 1955). Martin eventuallky tired of working with Wallis and Lewis; he was looking for more variety in their material. Increasingly, Martin and Lewis came to resent each other, often fighting, so they broke up the act in 1956. Martin's first solo film was Ten Thousand Bedrooms (released in April, 1957), which flopped. Martin took a pay cut to undertake a dramatic role in The Young Lions (released in April, 1958), and scored well in the film. He then co-starred as a big Southern gambler with Frank Sinatra in Some Came Running (released in December, 1958). During his solo career, Martin recorded extensively, appeared on nearly every television show airing at the time, and co-starred with John Wayne in Rio Bravo (released in April, 1959), co-starred with Tony Curtis and Janet Leigh in Who Was That Lady? (which played the Chinese in March, 1960), and co-starred with Judy Holliday in the musical Bells Are Ringing (released in June, 1960). By now, Dean Martin and Frank Sinatra had formed their "Rat Pack" performing in Las Vegas regularly. When not onstage, they filmed the caper movie Ocean's 11 (released in August, 1960). He played a Sounthern politician in the drama Ada (released in August, 1961). He then starred with Geraldine Page in the intense drama Toys in the Attic (released in July, 1963), then co-starred again with Sinatra in Robin and the 7 Hoods (released in June, 1964). Martin played "Dino" in director Billy Wilder's notorious flop, Kiss Me, Stupid (released in December, 1964), then played The Duke's brother in The Sons of Katie Elder (released in June, 1965). In the fall of 1965, NBC debuted The Dean Martin Show, running for 264 episodes until 1974. After that, The Dean Martin Celebrity Roast television specials would appear on the network through 1984. Saterizing spy movies, Martin starred in three Matt Helm movies: The Silencers (released in February, 1966), Murderers' Row (released in December, 1966), and The Ambushers (released in December, 1967). He joined the all-star cast playing an airline pilot in Airport (released in March, 1970). Martin's final starring role was in Mr. Ricco (released in February, 1975). Brought onstage by Frank Sinatra, Martin and Muscular Distrophy Marathon host Jerry Lewis had a tearful reconcilliation in 1976. Contributions soared. He appeared in both The Cannonball Run (released in June, 1981) and Cannonball Run II (released in June, 1985). His final role was in the television movie Half Nelson aired over NBC in March, 1985. A heavy smoker throughout his life, Martin was diagnosed with lung cancer in 1993. Refusing surgery, he succumed to emphysema on Christmas day in 1995 at the age of 78. Grauman's Chinese Theatre, Hollywood, California. 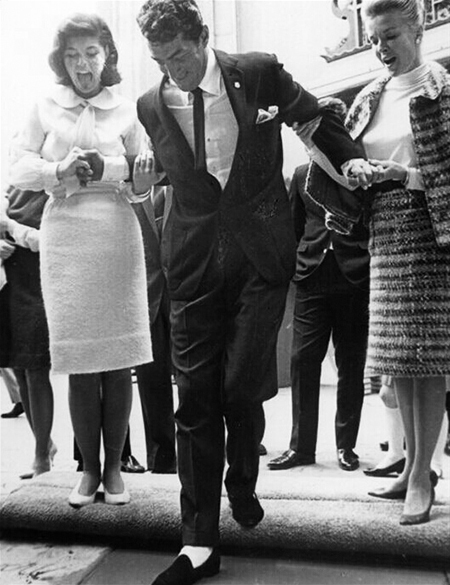 Dean Martin Forecourt ceremony, Saturday, March 21, 1964. Matin's daughter Deana, and wife Jeanne Biegger help the big fellah into the cement.